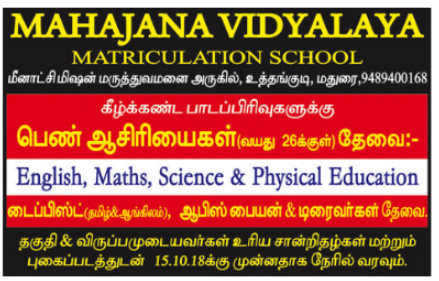 Mahajana Vidyalaya Matriculation School, Madurai has advertised in the DINAMALAR newspaper for the recruitment of Teachers (Female) jobs vacancies. Interested and eligible job aspirants are requested to walk-in on or before 15th October 2018. Check out further more details below. How to Apply: Interested and eligible candidates are requested to attend the Walk-in interview immediately along with CV, originals & copies of certificates and recent PP size photographs to the following walk-in address. Walk-in Date: As soon as possible from 07th October 2018, but before 15th October 2018.